Product information "Secure Kit: Wall Thermostat with LCD display plus actuator"
The SEC_SRT322 is a system to control warm water heating in general and floor heating installations in particular. It consists of a battery-operated wall thermostat (SEC_SRT321) installed in the room to be controlled and a relay switch (SEC_SSR303) to operate the water boiler. The SRT321 is a battery-operated wall thermostat. Using a big wheel on the device the user can preset the desired target temperature in the room. By verifying the target temperature with the measured real temperature closed to the device the unit decides how to operate a wirelessly attached power switch that is attached to the heater. 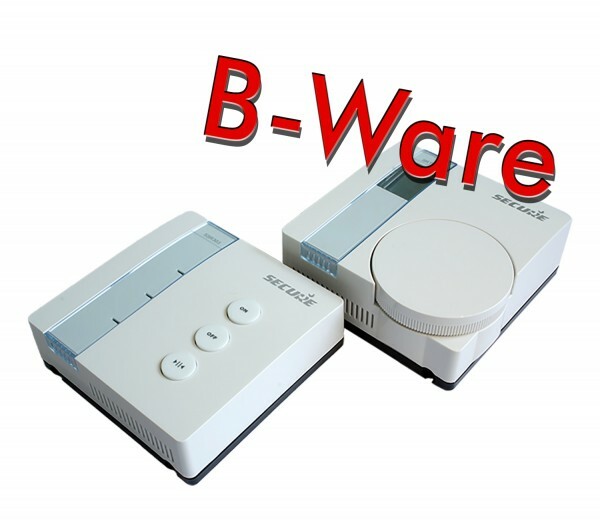 In parallel a central gateway of Z-Wave control software can set the target temperature using Z-Wave. This enables to realize a time scheduled zone heating. The thermostat itself does not have any internal timers but executes the wireless settings (COMMAND CLASS THERMOSTAT_SETPOINT) and the local setup. The thermostat itself doesn't own an internal timer. The SSR303 is a wirelessly controlled relay switch to operate loads up to 3 A / 230 V. It is used to control warm water boilers or magnet valves. The device can be operated locally using two buttons. A LED indicated the current switching status. The fashionable design of the device allows mounting it on visible positions in the home. Related links to "Secure Kit: Wall Thermostat with LCD display plus actuator"